Master Sgt. David L. Hurt, 36, died of wounds sustained from an improvised explosive device during a mounted combat reconnaissance patrol. He was a Special Forces Operational Detachment-Alpha operations sergeant assigned to Company B, 1st Battalion, 3rd Special Forces Group (Airborne). He deployed in support of Operation Enduring Freedom in January 2009 as a member of the Combined Joint Special Operations Task Force – Afghanistan. This was his fifth deployment in support of the Global War on Terror. Hurt, a native of Oak Park, Ill., volunteered for military service and entered the Army in November 1992, as a Combat Engineer trainee. After basic and advanced individual training at Fort Leonard Wood, Mo., he was assigned to Co. C, 307th Engineer Bn., 82nd Airborne Division at Fort Bragg, N.C. from the rank of private to Staff Sgt. He then was assigned to Co. C, 37th Engineer Bn., 20th Engineer Brigade at Fort Bragg. Hurt completed the Special Forces Assessment and Selection prior to being assigned to the John F. Kennedy Special Warfare Center and School at Fort Bragg, N.C., in August 1999 for Special Forces training. He earned the coveted “Green Beret” in May 2000 and was assigned to 2nd Bn., 3rd SFG(A) at Fort Bragg, N.C., as a Special Forces engineer sergeant. Hurt was then assigned to the USAJFKSWCS Non-Commissioned Officer Academy. He served as a Small Group Leader at the Basic Noncommissioned Officer and Warrior Leader Course from March 2005 to March 2008. 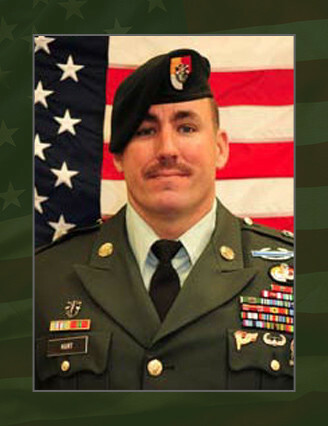 Hurt returned to the 3rd Special Forces Group and was assigned to Co. B, 1st Bn., as an operations sergeant in March 2008. Hurt’s military education includes the Survival, Evasion, Resistance and Escape Course, Sniper Course, Basic Airborne Course, Air Assault Course, Pathfinder Course, Ranger Course, Jumpmaster Course, Sapper Leader Course, Combat Life Savers Course, Special Forces Advanced Recon and Target Exploitation Course, Advanced Noncommissioned Officer Course, Basic Noncommissioned Officer Course, Warrior Leaders Course, and Special Forces Qualification Course. Some of his awards and decorations include the Bronze Star with two Oak Leaf Clusters, Meritorious Service Medal with one OLC, the Joint Commendation Medal, Army Commendation Medal with a three OLC, Joint Achievement Medal, and Army Achievement Medal with four OLC, the Combat Infantry Badge, Special Forces Tab, Ranger Tab, Sapper Tab, Master Parachutist Badge, Senior Parachutist Badge, Pathfinder Badge, Air Assault Badge, Drivers Badge, the Valorous Unit Award, Joint Meritorious Unit Award. Hurt is survived by his wife Kelly, daughter Avery and son Wyatt, all of Grays Creek, N.C.; mother Bonnie Hurt of Hope Mills, N.C. and father Joe Hurt of Memphis, Tenn.